I received the cigars for this review from Cigars Direct; as always, all reviews are my own. And that’s the frame of mind I have coming into smoking this cigar. Sure, you could look at the red, black and gold bands (one normal band in the normal place and another band, more than two inches in length, at the foot) and think this cigar is going to be a ball buster but that’s accepting marketing too readily. After all, how many times have you seen a cigar marketed as “full bodied” to find out it’s a medium bodied cigar without much flavor? I guess it makes sense to market cigars as being full bodied nowadays as the cigar smoking public does seem to like them but, when you fail to live up to that promise (and the cigar doesn’t taste good), you will lose trust. I’m not saying that’s the case here – the review will decide that one way or another – but this marketing gimmick is something that I have noticed with alarming regularity. Personally, I’m now numb to all that marketing jazz, so I basically forget about it… unless it’s obvious in the design of the bands and in the name of the cigar brand, as is the case here. It is a good looking cigar; very dark wrapper with a few medium sized veins and a rough, oily feel to it. This is the torpedo, which is a vitola that I am partial to (it’s also the only vitola they make for this cigar at this time). There are some bumps visible on the surface giving it a rustic look. Yeah, it starts out as a full bodied cigar and shows no signs of letting up; so there’s no lie in the marketing here. Banshee-like spice greets you in the beginning and sticks around for a while until it does moderate and becomes somewhat more enjoyable. Barley and cream are the other flavors that are evident here. I like the fact that it’s this strong of a cigar but I’m hoping that the flavors pick up a bit during the final two thirds. Oak and spice are the main flavors during the second third but the main thing here is that it’s a strong cigar. And I think that was what the makers were going after here; a really strong cigar. That’s fine and all but I want more. Burning in my nose from the full bodied smoke, which is the main thing that you will be getting from this cigar. I like full bodied cigars and, by all rights, I should be all over this cigar liking every last puff but I find myself not enjoying it very much. Again, spice and oak are the main flavors and there’s also a bit of earth going on. 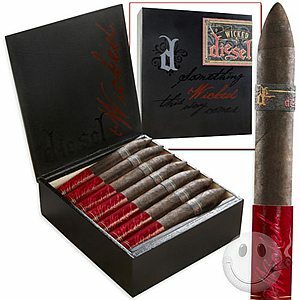 Full bodied with a good draw and burn; the Diesel Wicked is fine for what it is, strictly a full bodied cigar, but there needs to be some strength in the flavors as well, which wasn’t evident here. Take the Joya de Nicaragua Antaño 1970 as an example. It has a ton of strength and a ton of flavor as well, even in the diminutive vitola that I reviewed (click the link in the previous sentence to see what I’m talking about). It’s not all bad, though. The flavors aren’t bad they just aren’t very strong. It’s an okay cigar and if you’re looking for strength this does fit the bill. But, at that price…. PS: I actually bought a box of these cigar without trying a single one, which was a mistake. What was interesting about this purchase is that the box comes with a mystery cigar, which I will eventually smoke and post a review of. So stay tuned!